The excitement of turning a jagged piece of stone into a gleaming gem or rock motivates rock hounds to polish stone after stone. 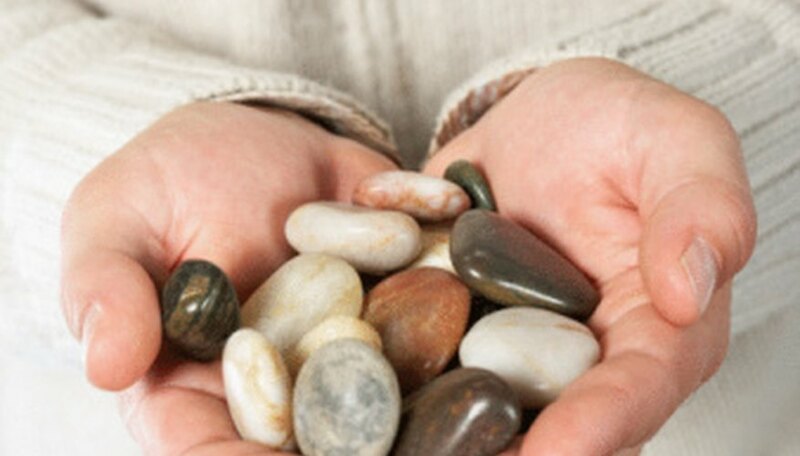 Polishing rocks is a satisfying hobby, but the use of a rock tumbler to achieve the polished result is surprisingly unnecessary. With a few simple materials and some elbow grease, even the most novice rock hound can create beautiful polished stones and gems from a jagged collection. Fill a bucket with hot, soapy water and clean away all the dirt and residue from the rocks. Use an old toothbrush to get into any crevices and to remove stubborn bits of dirt or grime. Use a handheld rotary tool, often called a dremel tool, to begin grinding the stones and gems into shape. Make sure you are wearing protective eye wear and gloves for this. Grind down sharp edges and crevices to help make sanding the stones and gems a little easier. Sand the stones and gems for shaping. Begin with a coarse grain of sandpaper, and moisten the paper with water. Begin sanding until most of the rough edges begin to become smooth and rounded or until you see the desired shape of the rock. Be discriminating with your grain of sandpaper, as some stones and gems are softer than others. You may find that softer gems or stones do not require the coarsest grain of sandpaper. Sand the stones and gems again to prepare them for polishing. Begin with a medium grain sandpaper, and sand the rock down to both its desired shape and smoothness. As you see your desired results, use lighter grain sandpaper, finishing with ultra-fine grain. Apply the finishing polish to the stones and gems. Using a heavy fabric such as denim, polish the rocks until they begin to shine or show luster. At this point, you may choose to either continue polishing with the cloth, or you may coat the stones and gems with mineral oil or commercial rock polish. Allow them to dry. Use protective eye wear and gloves when working with the rocks. Lake Superior Rocks "Polish Rocks by Hand"
Rock Tumbling Supplies "Polishing Rocks by Hand"
Peppers, Stephi. "How to Polish Rocks & Gems Without a Rock Tumbler." Sciencing, https://sciencing.com/polish-rocks-gems-rock-tumbler-8164627.html. 13 March 2018.